Last year, lighting gel company, Rosco acquired LED lighting specialists DMG Lumière. Although only founded in 2014, DMG Lumière was quickly recognised for its innovative products for film, television and broadcast. We all knew at the time that this would be an interesting mix of companies and talent that would probably go on to produce something quite special. Now, it seems, they have. The Rosco MIX, is a new colour changing LED panel based on DMG Lumière’s previous form factors. What makes these special though, is that unlike traditional bicolour, RGB or RGBW LED panels, these contain six differently coloured LEDs to produce a wide array of colours. Famous for their high-quality lighting gels, Rosco’s new light won’t even need them. Every photographer knows what it’s like to get an idea for a photograph and then struggle to figure out how to execute the shot that’s in their head. If you are using hotshoe strobe, you are probably familiar with the Rosco Swatchbook. 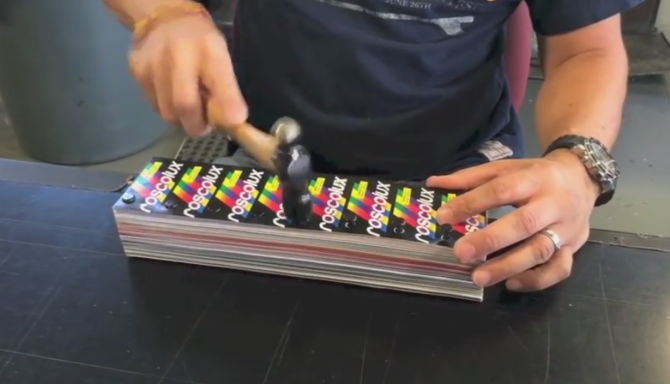 At roughly 7 US Dollars this wonderful swatch book let you gel your strobe to any possible color. If you are lucky, you can get one from your local cine or photography store, but even if not, it is still a good purchase. (Way, way back, giving it away for free almost collapsed Rosco samples plan when thousands of photographers asked for a free sample. They solved this huge demand with the Strobist Gel Pack, which got an update about a year ago). A few years back Rosco were faced with a problem. With the rise of off camera flash use, many photographers discovered the free Rosco sample gel pack. What began as a service for studio owners and stage managers, soon turned into an “unlimited” supply of gel packs for photographer. Of course being a business Rosco could not continue and supply the world with free gels (impacting both their own operation and creating a shortage with paying customers). Rosco dealt with this situation pretty cleverly, creating the Strobist Gel Pack along with David Hobby. It was a very cool kit at a very affordable (~$10) price. It was one of those things that never left my camera bag (we did a short fun review here) we reviewed it here (and here). After reviewing the Rosco Strobist gel collection, I just had to take it for an intense spin. Since one of the main uses I see for this kit is the ability to color objects and backgrounds for creative effects, I did a little matrix of colors. (I am a computer geek, I know). As with all the other cheat sheets on the site, I will go through the idea, the setup and end with a creative commons statement. Unlike the other cheat sheets, we are also going to have a Rosco Strobist gel collection giveaway. That stuff is near the end of the post.